We've spent so much time together the past nine years. Other than my trusted assistant, Yvette, you have been my nearest companion. You've contained all my clippings, housed plants, hauled my mulch, and toted my baby plants to blogger plant exchanges. Whatever I needed you for, you were there. I noticed, when you first cracked, but I looked the other way. Years of gardening gets to the best of us. Rain, sleet, snow, hail, heat, sun, you made it through it all like a champ. I guess I could wrap you now in duct tape, but I can never make you whole again. While your little green brother has helped out in the past, he can never fill your larger shoes. I'm heartbroken too. It was bad enough when he cracked once, but he had to do it twice! I actually threw him out, but then had to go rescue him from the bin on "Garbage Eve" because I couldn't stand to lose him. I'm going to wrap him in duct tape and continue to use him, at least until I can find a replacement. 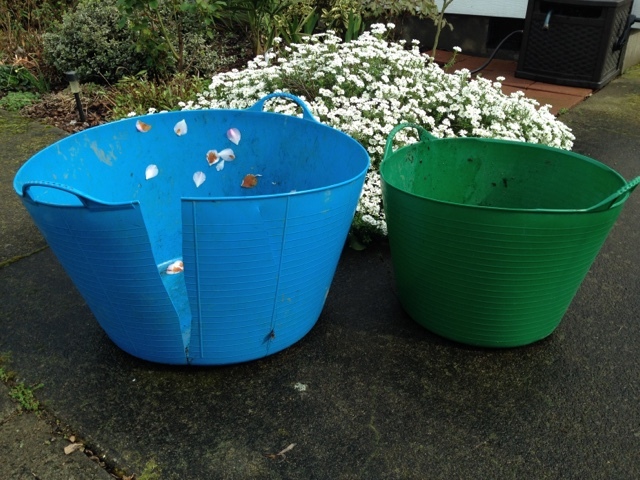 I have two large trug/buckets like your blue one. They are indispensable at this time of year. I use them for the overflow that won't fit into my yard waste bin. I have the green one and I would CRY if something happened to it!